Posted on November 3, 2017 by Matthew Leib. This entry was posted in Spotlight, Staff Stories and tagged Coaches' Corner, Spotlight, staff story, UW Athletics. Bookmark the permalink. There is no such thing as a soccer emergency. At least not in the life of Lesle Gallimore. It’s not that the head coach of UW Women’s Soccer isn’t competitive. To the contrary: the California native is the winningest coach in program history and recently earned her 250th UW victory in a 1-0 contest at Oregon on October 8. Ask her about the milestone, however, and she’ll tell you the losses have meant just as much in making her the coach she is today. Coming off a string of hard-fought, nail-biter losses against Pac 12 competition over the past five games, her 28-member squad will be looking forward, not back, when they square off at home Friday for Senior Day against WSU in this year’s Apple Cup matchup. It’s an even keel Gallimore has steadily maintained through 24 seasons as head coach, having joined UW in 1994 after four years as head coach at San Diego State. She emphasizes a player-focused approach in which a sense of care and individual integrity on the part of players and coaches form the underpinnings of a successful program. Gallimore says her promise to players as a coach is to put them in a competitive environment, but also demonstrate integrity, caring, and commitment in ways that convey that decisions she makes around the team have to do with helping them be better—as individuals and as a collective unit. Gallimore says she plans to one day write a book—a thought that hadn’t occurred to her until a few years ago. “I have something to say about this profession, what I’ve done in my career, and the lessons I’ve learned that I think would either help out younger coaches or be insightful for this environment,” she says. Specifically, she thinks the sport can do a better job retaining female coaches. “There’s a cluster of us who’ve stayed at it a while—we got really fortunate in our careers to either be thick-skinned or good enough to hang in there and hone our craft—but there’s a way bigger group that’s fallen by the wayside,” she says. Gallimore began coaching 32 years ago as an assistant at University of California, Berkeley. Raised alongside three brothers by her mother and grandmother after her parents divorced when she was young, Gallimore started playing soccer after her mother—already busy wrangling three Boy Scouts—dissuaded her from joining Girl Scouts. Gallimore could walk to the practice field from her house and the sport cost little to play. “I fell in love with it,” Gallimore says. By the age of 13, she was playing in the Y19 division. Not thinking she would play competitively in college, she attended University of California, Irvine, returning home on weekends to still play on their club team. Before long, coaches at Cal Berkeley and Santa Clara took notice of their play and, the next year, Gallimore and several teammates transferred to Cal—effectively taking over the club program and ultimately getting it varsity status. A four-time All-American defender who helped lead the Golden Bears to the national playoffs three out of her four seasons, Gallimore graduated and started law school, but continued on as Cal’s assistant coach. After a year, she decided to set aside the study of law to keep coaching full-time. But Gallimore says she’s long since let go of that sense of needing to prove her abilities—having found happiness as a coach and the opportunity to build a legacy at the University of Washington and, more broadly, in U.S. soccer. Gallimore does so with a sense of confidence in self, but credits others for having helped foster it. Gallimore credits associate head coach Amy Griffin (now in her 23rd season on the coaching staff), former UW Athletic Director Barbara Hedges, and former UW Associate Athletic Director Marie Tuite for their mentorship and influence. Tuite (now athletic director at San Jose State) previously served as an associate athletic director at Cal when Gallimore was a student-athlete. 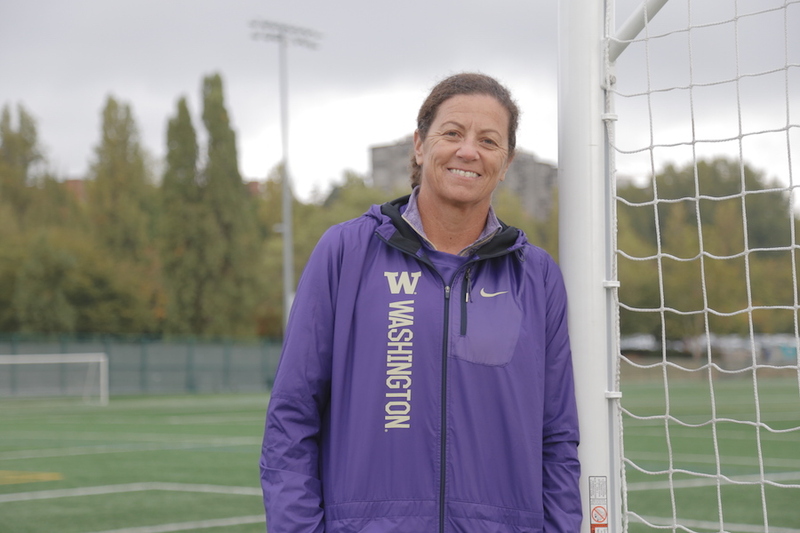 Gallimore’s tenure as head coach of UW Women’s Soccer bridges one era to the next, but she says the present feels as exciting as it’s ever felt to coach at the UW. It’s largely why she’s quick to spread the credit for her 250-win milestone. She says she’s proud of her team for who they are and how they’re different. Beyond the people, Gallimore’s daily motivation as a coach comes from a sense of introspection. For Gallimore, coaching remains a challenge and a thrill. Hear more from Coach Gallimore in this week’s Media Minute, then follow Husky women’s soccer on Twitter @UW_WSoccer and Instagram @uw_wsoccer and catch the team Friday at 7:00 p.m. as they close out the regular season!